Suzuki's series of inline-four motorcycles that most notably contains the Katana branded motorcycles. The GSX name signifies that the motorcycle has 4 valves per cylinder as oppose to the GS series which only has 2 per cylinder. The GSX Series is Suzuki's range of sport touring motorcycles. The GSX series is produced as the GSX600F and GSX750F sport touring models and the GSX1300R Hayabusa hypersport. In Europe, Suzuki has been selling a large (1402ccm) retro-design sport touring model since 2001 - the Suzuki GSX1400. The GSX250F is known as the Suzuki Across and is notable as it has a rear petrol tank and a helmet storage area where the petrol tank usually is. The Suzuki GSX Series is Suzuki's range of sport touring motorcycles with four-valved engines. 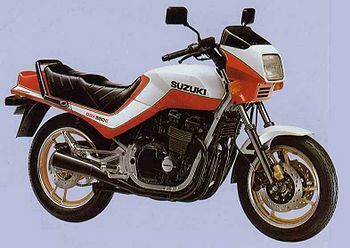 The earliest GSX models were introduced in the early 1980s to complement and later replace the two-valve Suzuki GS series. The current range of bikes by that name are completely different designs that use derivatives of former super sports engines from the early-to-middle GSX-R series. Among the earliest GSX models were the two-cylinder GSX 250 and the GSX 400. These Suzuki GSX models were the evolution of the Suzuki GS series of 2-valve per cylinder air and oil cooled four stroke motorcycles. The first 4-valve engines were produced for the 1980 model year, but retained the "GS" designation for the US market until the release of the GSX-R models in 1986 (1985 outside the US). These GSX engines were based on Suzuki's "TSCC" (Twin-Swirl Combustion Chamber) engine design, and shared little with previous 2-valve models. The bike called Suzuki Katana in the US had this engine design, with designations of GSX-S, but has little in common with the more modern GSX-F Katanas, which are sport-touring bikes. The early GSX four-cylinder engines are arguably among the most reliable motorcycle engines ever mass-produced, with the 1100cc and 1150cc engines still very commonly used for drag racing and hill climbing competition in the US. The 1983 GSX 750ES was a ground-breaking model in its own right, with air-adjustable anti-dive forks, preload and compression-adjustable rear mono-shock ("Full-Floater"), disc brakes at both ends. Some of the futuristic features it pioneered, like a fuel gauge, have since become far more commonplace. Others, like the digital gear indicator, turned out to be redundant marketing ploys now considered retro and obsolete. The bike disappeared from dealers in 1984, to be replaced with the GSX 700 - a bike with a de-stroked engine and minor cosmetic differences. Minor tweaks included taller pistons and slightly differing cam lift and timing. This plus a change in factory gear ratios enabled Suzuki to produce a motorcycle with near-identical performance specifications to the GSX 750ES, even though engine displacement was 15 per cent smaller to satisfy the revised US import guidelines. These included increased tariffs imposed by the US government on all imported motorcycles displacing more than 700cc (repealed in 1988). This 50 per cent tariff was the reason behind the glut of de-stroked 650cc and 700cc Japanese motorcycles sold in the US in the mid-1980s - unique to the rest of the world - and is also the reason the GSX-R debuted in the US a full year later than the rest of the world. The GSX 750E lived on for a few more years abroad, but was eventually superseded by the GSX-F series Katanas. The GSX-S Katanas were also dropped from Suzuki's regular lineup, replaced by the GSX-R series. The GSX 1100 lived on with significant styling changes for the 1984 model year, including a full-faired 124bhp monster of a musclebike, the GSX 1100EFE (US: GS1150EF). The larger bikes, although still sought-after as classic superbikes, were also replaced by the GSX-R and GSX-F Katana lineups, with significant body styling changes, upgraded suspension and braking components, and revolutionary frame revisions. The GSX 750ES lives on in the market of previously owned bikes as an affordable all-around motorcycle, although with limited aftermarket and manufacturer support for parts. The US-only GS 700 is still fairly common there. The GSX 750S (US: Katana) received an updated engine for 1984, along with Suzuki's other big-bore 4-valvers. This is the engine that the first Suzuki GSX-R Series bikes were based on. Current GSX models are powered by derivatives of this in-line, four cylinder engine with four valves per cylinder, which is also used in the Suzuki Bandit Series. They feature a combined air-/oil cooling system called SACS (for 'Suzuki advanced cooling system'). The earlier GSX 1200 Inazuma was offered in Japan only for a short time besides the GSF 1200 Bandit to cater for a clientele that went for a more traditional styling and a somewhat higher build quality. When it proved sufficiently popular for overseas export, it was quickly developed into the current GSX 1400. These modern non-US GSX-models carry little in common with their early to mid-eighties cousins other than a distant ancestor in their powerplant. The GSX 1100S Katana has been reissued as an anniversary model several times for the Japanese domestic market (where the GSX 400S Katana remains a very popular model with styling straight from the early-1980s), and Yoshimura has recently released a small handful of fully re-worked factory GSX 1100S Katanas for sale, requiring potential buyers to win an essay contest before being granted the opportunity to purchase one of these rare beasts. The GSX1300R Hayabusa hypersport bike has nothing in common with other GSX models but three letters of its designation and the most basic design parameters (number of wheels, cylinders, and valves per cylinder). Pages in category "Suzuki GSX series"
This page was last edited on 21 January 2011, at 15:42.